I saw Jargonion do something similar to this the other day so I went ahead and stole his idea. I've walled off an area so I could farm it relatively safely, and tunneled into a cave. I was doing great with 4 people for quite a while, but hubris got the better of me so now they're eating faster than I'm producing. Hoping the season will grow me enough food to tide me through but who knows. Apart from that, collecting wood is a bit of an issue, studying tree growing to keep trees nearby. I have a pet rat. I don't know if it has any value. Wow, nice! I really wish I did watch you play that little bit. Whats this game like? Looks like prison architect? But on a planet? It's like dwarf fortress, but more user friendly. It's an excellent, engaging game. 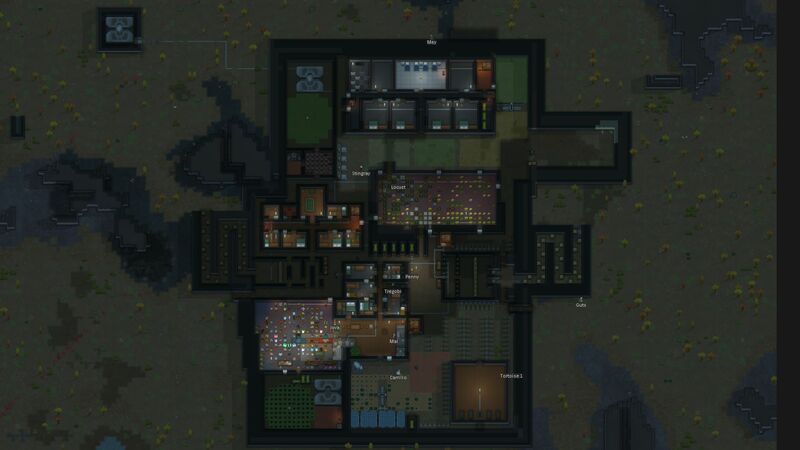 I was going to do a series of images, showing the development of my colony. Somehow, my pictures got out of order and it became more trouble than it's worth. 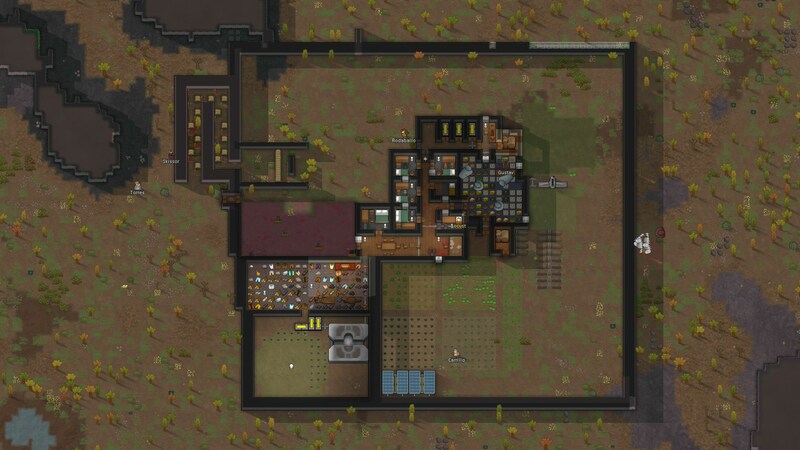 This has been my most stable colony yet. I had an early winter thanks to a cold snap, then volcanic winter started right after winter ended. My food stores are still completely robust. Not my plans for defences, and my new hydroponics area-to-be next to the geothermal power generator. After taking this shot, since everything is now stable, I got raided endlessly, and the whole thing is about to collapse. A flash storm turned up for literally 3 seconds. It also burned down a quarter of the map. So, here's a neat bit about my map. When I started this run, I wasn't impressed with how open it was. I scouted for my ancient danger, and cracked it open to see what I'd be dealing with. Inside where two scythers. I built my base far away from the ancient danger, and life was good. Every time an animal went manhunter (or a pack, like the monkeys shown above), they've target the scythers and get destroyed. A couple of raider came too close on a few occasions, too, and got killed. But I wanted the loot inside. One day, a boomalope self tamed. I saw my chance, and sent it into the ancient danger. The scythers killed it immediately. 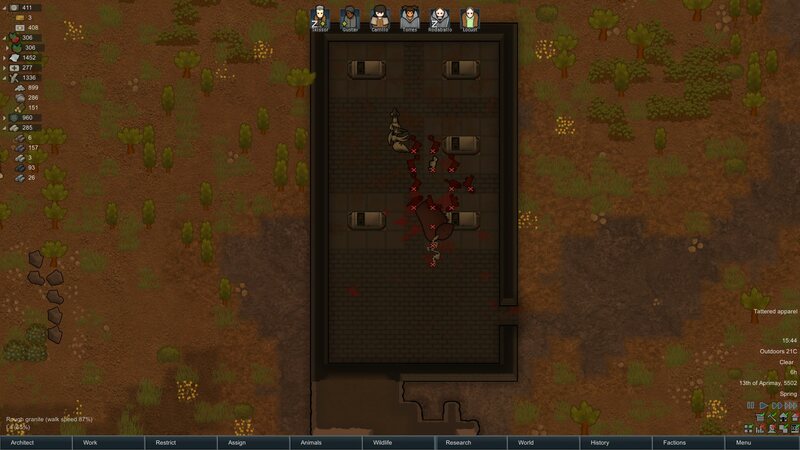 The explosion caused a nice bit of damage, and opened up the cryosleep caskets in the room. Half the inhabitants were immediately downed (subsequently stripped before death for awesome gear). One other inhabitant was killed by a scyther. 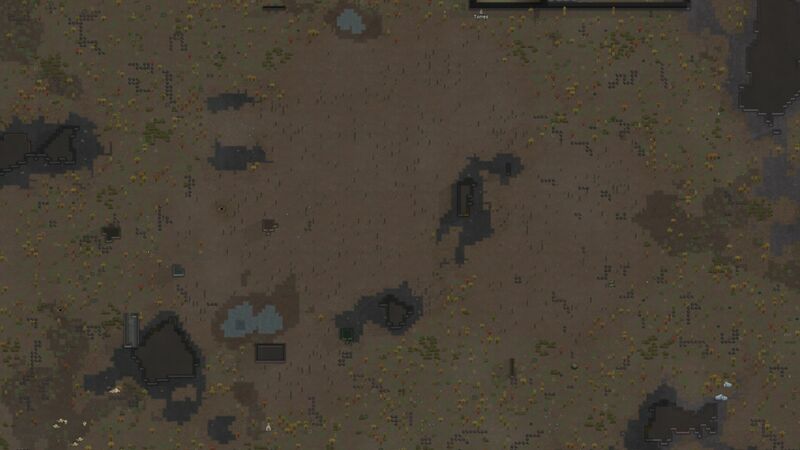 The final inhabitant killed the two scythers, tried to raid my base, and was immediately felled. And that's how I got great armour and weapons, clearing out an ancient danger with no risk to myself. Just a quick update for Taco on how the base is looking. He saw some of it yesterday. Since my last post here, I have made some neat changes. 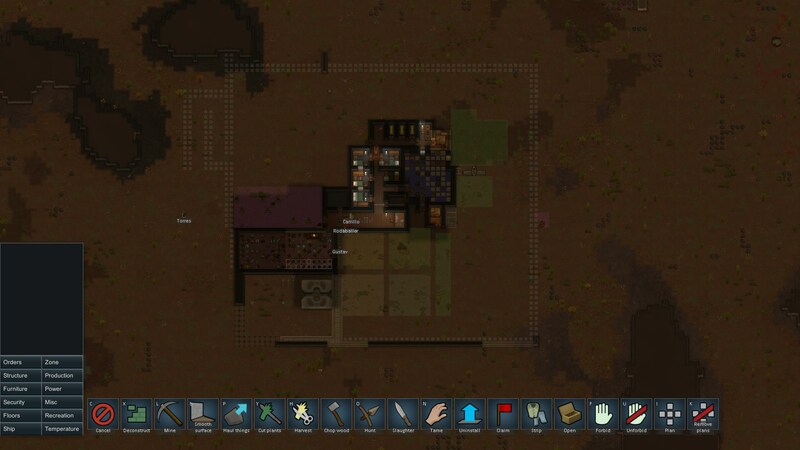 The biggest issue was that sappers would break through my walls, making my traps less effective. I countered this by making my perimeter walls four tiles thick. 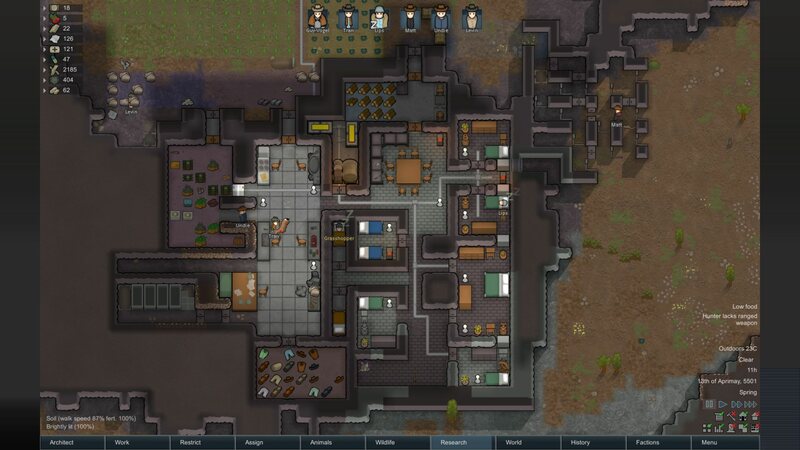 Next, I tried to use that space at the top of my base for better barracks- Managed to make a few nicer rooms, but didn't plan properly and didn't have enough space for a central barracks. Then, I added an eastern maze of deadfall traps- enemies can approach form any side, and having my only entrance/exit on the west wasn't working too well. Then I built north a tad to capture a steam geyser. Eventually, I just pushed the whole northern wall up to come in line with the geyser room, and made a proper (sterile) hospital, and a few more nice rooms. For safety sake, I captured another steam geyser to the west, and mostly use it as raider-bait. A couple of walls around it with a powerline keeps it moderately safe, and gives a great power boost (you might notice my power concumption's through the roof). 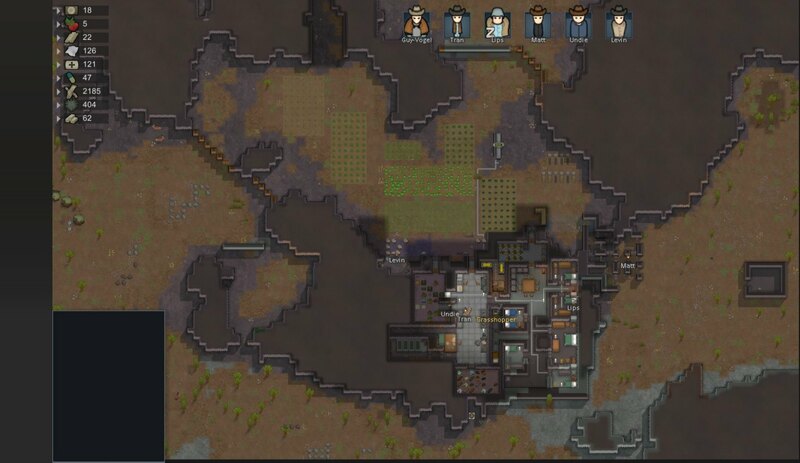 I also had a toxic fallout earlier, so now most of the base is under a roof. 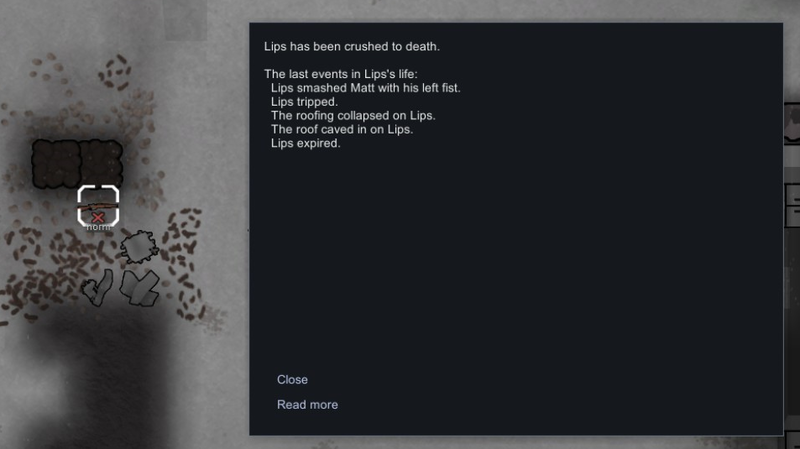 Finally, I don't have all the space in the world for corpses, so I have a small ruin out to the far west. I stockpile all my corpses in there now, and toss a molotov cocktail on the pile when it starts spilling out of the ruin. As a final note- I have started researching spaceship components. Soon, I could actually finish the game....if I can withstand 15 days of non-stop raids.